For Christmas, I bought myself a little camera. There are times when I just don't want to pick up the monstrosity, set the ISO, WB, aperture, etc just to take a picture. I bought a PS (point & shoot). [GASP] And I love it. I can, from the comfort of my little sofa, take pictures like this. Without ever moving. Isn't he a cutie? Yeah, I think so too. 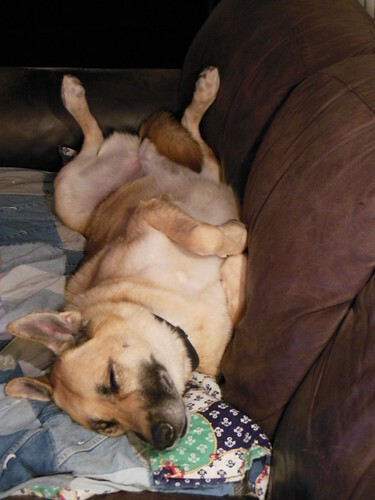 My 100 lb German shepherd guard dog, hard at work. I LOVE my point and shoot and it's amazing what they can do now. I still love my DSLR, but it's so great to have a little camera in my purse at all times. This is my second little camera. I can't believe how small they have become and still shoot better than my first DSLR and HD video. Crazy. I am with you there. I am getting a point and shoot for Christmas just for the ease of grabbing and going. Only 2 more sleeps before I can unwrap that joy. Well I am hoping to see some of your pictures with your P & S !